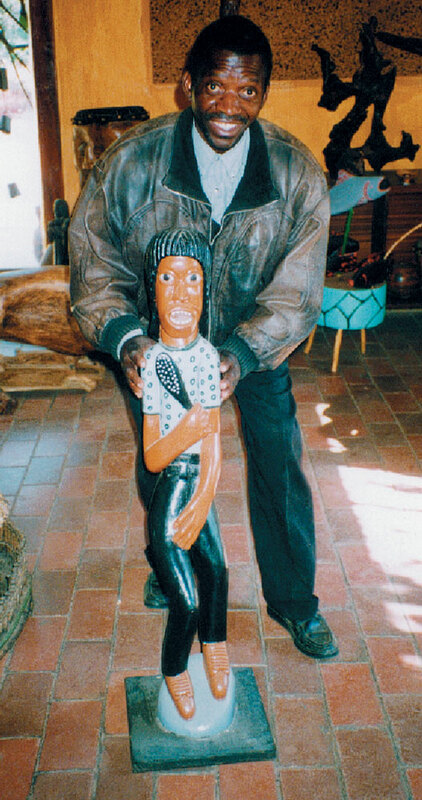 Although younger than many of the sculptors from rural northern Limpopo, Johannes Maswanganyi, similarly, had no institutional art training; his father taught him to carve traditional and functional items such as utensils and headrests. His work was included in the 1985 Tributaries exhibition with two nyamisoro figures (seated figures of traditional healers). Based on the traditional Tsonga medicine containers, the carvings showed the ways in which Maswanganyi adopted older forms to make new ones. Like the older forms the figures had removable heads with bodies hollowed out for the storage of medicines but they are much larger and carved in one material. They are important not only for the development of Maswanganyi’s work but also because they provided a way towards more recognizable figurative imagery. Maswanganyi works in a variety of sizes depending on the wood available but prefers a larger scale. Initially he worked on the formal style set out in the nyamisoro as exemplified in the two sculptures in the collection, which date back to the late 1980s. Different, however, is that they are removed from tradition by virtue of their western style. It is figures such as these that became the prototypes for the many portraits Maswanganyi carved of local and national political leaders. Maswanganyi formulated and developed other concepts in the adoption of different subjects. For Christian and historical subjects he started to use more complex compositions using a number of figures. He also tried various ways to include landscapes in sculptural forms by including logs or twigs and covering them with household paint, following the style of Seoka (qv.) who lived relatively nearby and whose work he knew. If Seoka was confused by the demands and practices of the urban art market, Maswanganyi took these on and became his own dealer and middleman. He acquired a truck and transported his work from Msengi to the cities to sell directly to galleries, shops, collectors and dealers. He was responsive to and influenced by what he saw in the cities both as an artist and entrepreneur. Some of the changes in his sculpture can be attributed to works he saw in galleries; importantly this alerted him to the prices paid for art in the cities. Maswanganyi also recognised in these encounters that there was a market for traditional beadwork; he started to collect older pieces and later developed, with his family, beadwork and embroidery items for sale to this market. Born 1948 at Msengi Village, near Giyani, Limpopo Province. Exhibitions 1985: Tributaries, Africana Museum in Progress, Johannesburg and Munich, Germany. 1986: Standard Bank Foundation Collection of African Art, University of the Witwatersrand, Johannesburg. 1987: Solo exhibition, Market Theatre, Johannesburg. 1988: Vita Art Now, Johannesburg Art Gallery; Group Show, FUBA, Johannesburg; The Neglected Tradition, Johannesburg Art Gallery. 1989: Images in Wood, Johannesburg Art Gallery. 1994: State of the Art, Everard Read Contemporary Gallery, Johannesburg. 1995: Zeitgenössische Kunst aus Südafrika, Bayerische Vereinsbank Munich. 1996: Colours, Haus der Kulturen der Welt, Berlin. 2001 onwards: Group Exhibitions, Mukondeni Fine Arts, Johannesburg. 2001–2003: Motho ke motho ka batho (see Seoka). Collections Iziko SA National Gallery, Cape Town; Durban Art Gallery; University of the Witwatersrand; Johannesburg Art Gallery; Sanlam Art Collection, Bellville, Cape. Photograph of Johannes Maswanganyi. Courtesy of Neil van Kraaienberg, Gallery 181, Johannesburg.